Few months have passed since my last post… lots of new things and changes. With them I intend to embrace sketching daily and experimenting with more media. Today I share a composition inspired by my new cactus Chimoltrufia. It’s made on 9″x12″ 140lb. cold press Strathmore Windpower watercolor paper. 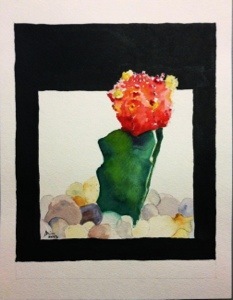 The color part is watercolors and for the frame I used carbon black liquitex ink.